On that day many will say to me, ‘Lord, Lord, did we not prophesy in your name, and cast out demons in your name, and do many mighty works in your name?’ And then will I declare to them, ‘I never knew you; depart from me, you workers of lawlessness.’ (Matthew 7:22-23). 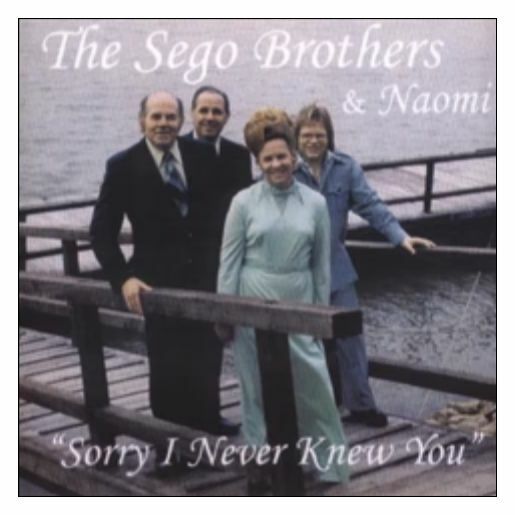 A few days ago I’d mentioned I had heard a song from 1964 by the Sego Brothers and Naomi called Sorry, I Never Knew You. In the song, a man was dreaming that he was standing before Jesus on Judgment Day and to his shock, he was placed on Jesus’ left. He heard Jesus say to him, “I never knew you.” It was the first Gospel song to sell 1 million copies. The verses in Matthew, to me, are some of the most haunting and devastating prophecies in the Bible. Prophecy is surer than a promise, it will happen. On that day many people who claim to be Christian but are not will try to prove it to Jesus by recounting their deeds in His name, but sadly, they were self-deceived and will be sent to the Lake of Fire for eternal torment instead. The problem of professing Christians who do not actually possess Him is significant. The global church is bloated with counterfeit Christians, some of whom know they are false and gleefully upset whole families and sneakily pollute their church. (Titus 1:11, Jude 1:4). Others have only a dim clue they are false but never repent or even try to seek him, perhaps lazily believing their deeds will be enough to get them to heaven instead of repentance and faith. Others have no idea at all they are on the broad path to destruction. While that certainly could be the case, sometimes the person really isn’t saved. They’ve become genuinely worried when they perceive a major difference between their ‘walk’ with Jesus and others’ walk with Him. These queries should be taken seriously, very seriously. Not everyone who professes faith possesses the Spirit. One thing that is sometimes neglected in the discussion of spiritual growth is the fact that the assurance of our salvation contributes mightily to our maturity. If we have a proper understanding of assurance, it becomes an impetus for holy living. When we know that we belong to Jesus, our love for Him motivates us to obey His commands and thus we increasingly display the reality of salvation. In the final analysis, any assurance we have of salvation is grounded in the person and work of Christ. By His life, death, resurrection, and intercession, He has demonstrated His full ability to save His people. We are justified because of His righteousness, and so the confidence we have in our salvation is not ultimately a confidence that we have in ourselves but a confidence that we have in the Savior. Despite this fact, an important existential question remains. If true faith is the instrument by which the righteousness of Christ is imputed to us, how do we know that we have true faith? How do we know that we are not only professing faith but also possessing it? There are several evidences of true faith. One of the most important is whether or not we have love for Christ at all in our hearts. Dr Sproul continues with other pieces of evidence. It’s a good article, and short. In the weeks after I was first saved, I was convinced that I could grow just as much by watching TV preachers and not have to go sit in a congregation. I’d never attended church in my 42 years of life (except for a wedding, baptism, or event as a visitor) and I definitely didn’t want to start. So I stayed at home for almost a year and watched Joel Osteen. In 2004 he was at the height of his popularity. He was in the throes of buying the Compaq Center which would host the tens of thousands of people that flocked to his church. I liked Osteen for three reasons. 1. He made me feel good. 3. All those tens of thousands of people could not be wrong. Someone gave me a Bible, thankfully, and once I began comparing what Osteen said with what the Bible said, it was game over. The Spirit exposed Osteen to me as a liar. But back to the numbers. Many people think that because a church is large or that so many people attended the Crusade and “came forward” or so many youths were saved at camp etc. that these numbers are evidence of genuine conversion. Not so! Quite often, it’s the opposite. (Luke 6:26). I remember a few years ago when John MacArthur hosted the Strange Fire conference. This was a conference designed to scripturally expose practices that are misleading hundreds of millions of people. Tim Challies live-blogged the conference. He shared the numbers. One objection to the conference was that it was making a big deal of only a small part of the movement, the so-called lunatic fringe. Not so, Challies said. [Naysayers claim] This issue is only true of the extreme lunatic fringe side of the movement. MacArthur believes that this statement is patently untrue. There is error in this movement all the way through it. 90% of the movement believe in the prosperity gospel. 24 to 25 million of these people deny the Trinity. 100 million in the movement are Roman Catholic. This is not characteristic of the fringe. This is the movement and it grows at a rapid rate. I want to turn back to Matthew 7:22-23, the verse where Jesus said ‘many will say to me, Lord, Lord…’. I looked up the word “many” in the Greek. In this verse, by Strong’s Greek Dictionary, it is the word polloi, main word polys. polýs – many (high in number); multitudinous, plenteous, “much”; “great” in amount (extent). 4183 /polýs (“much in number”) emphasizes the quantity involved. 4183 (polýs) “signifies ‘many, numerous’; . . . with the article it is said of a multitude as being numerous” (Vine, Unger, White, NT, 113,114) – i.e. great in amount. Do you see the issue??? ‘Many’ is an exceedingly great number! A great quantity. It’s not just the jungle tribesman who will be rejected, not just the militant atheist. It is possibly the woman sitting next to you in the pew! Maybe the youth who served on all the committees! Hopefully not the long-term deacon! I’m not saying that we should go around looking askance at every person in the church, suspicious of their faith or standing before Jesus. I am saying that first, the issue is so much bigger than people think. Hundreds of millions of professing Christians on this earth at this very moment think they are going to heaven but they are not. How much do you have to hate them to let them keep thinking that? It’s one great, biblical reason that the Strange Fire conference was loving. And second, if a person comes to you unsure of their faith, don’t dismiss their concerns. Really come alongside them and delve. Sit down, listen, and love them. If they wonder and they trusted you enough to come to you, then it’s a serious conversation that needs to be had. Third, if you have known a sister or brother a long time and there does not seem to be any fruit whatsoever, and instead you see a long-term pattern of rebellion of one kind or another (they promote strife, they gossip and slander, they refuse to submit to their husband, etc) then if you have a good relationship with that person, and there seems to be a good moment to sit down over coffee, gently bring up the issue. The book of 1 John is helpful here. Remember the word polys. ”Much in number, emphasizing the quantity involved. We love Jesus and have no issue with His right to reject whom He will reject and judge those whom He will judge. It will be a glorious moment of vindication where we can praise Him in His final victory over His enemies. However, while we are still here on earth, we love and care for our neighbors. What a devastating moment if the Lord says “I never knew you.” But what a glory to His Spirit if you have helped a person examine their faith, discipled a wobbler, prayed for a person of whose faith you were unsure, and on the Day they come out the other side and are placed on Jesus’ right! Oh what a day that will be. This article might help. There are all kinds of different Counterfeit Sanctifications.